The Mercury Extension Lead features four UK plug sockets (type G) and is fitted with a UK plug. Built-in surge protection ensures your electronic equipment is protected against power surges and spikes. Four integrated USB connectors share a maximum current of 4.8A and are ideal for charging multiple smartphones, tablets and other portable devices. The extension lead has rear keyholes which enable it to be easily mounted to any wall. 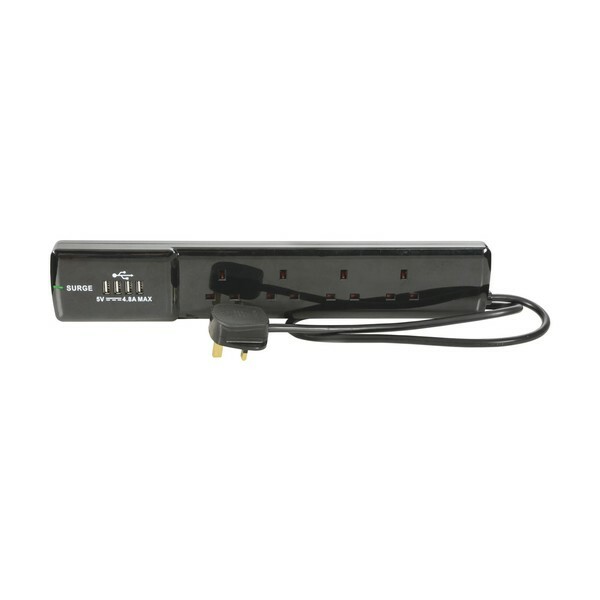 Providing a length of 2 metres, the Mercury extension lead allows you to power electronic equipment that is positioned away from the mains socket.